Shazam! is on the cover of EW's issue dedicated to San Diego Comic-Con. The DC superhero is set to have a major presence at the massive pop culture event, which officially kicks off Wednesday with preview night. Zachary Levi is on board as the titular hero and he's front-and-center on the cover, in addition to a brand new photo that has been released, showcasing quite possibly the best look at the hero in costume yet. The Shazam suit has been the subject of some debate, as it looks padded and, from some angles, straight-up cheesy. 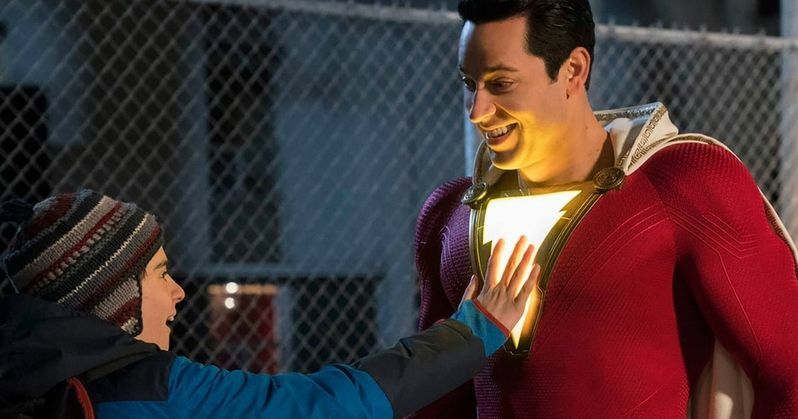 Then again, this is about a 14-year-old boy named Billy Batson (played by Asher Angel) who says a magic word and turns into a superhero who is nearly as powerful as Superman. So maybe light and cheesy is good. In any case, this latest photo, which features co-star Jack Dylan Grazer (IT) and has the lightning bolt on the hero's chest all lit up, actually looks pretty great. Zachary Levi is beaming with positivity about his new role. Here's what he had to say about it. "It's complete wish-fulfillment, if you scour all of DC and Marvel there are very few characters that are actually stoked to be a superhero. They're not brooding, they're not put out, like 'Oh dammit, I gotta save the world again!' Billy Batson is like Peter Parker, they're thrilled to have these powers and can't wait to try them out." The actor and former Chuck star joked on Twitter, "Hey @EW! Big fan. Sooo, this Comic Con issue... I know it's like days away from dropping, but is there any chance I can get on the cover? How do we make this happen? Asking for a friend who was too embarrassed to ask for me." The publication obliged. To squash any debate about Levi not beefing up for the role, which he clearly did despite the alleged costume padding, he revealed that the suit is a very tight squeeze. "It fits me like a glove, because it is a f-ing glove. It's super tight, but it's great. I look and feel like this jacked superhero." Warner Bros. is set to showcase their upcoming DC movie slate on Saturday at SDCC. The Aquaman trailer is confirmed to be coming our way and you can bet safely that we'll also be getting a teaser for Shazam at that time. But will it be released online, or just shown to the lucky fans in attendance? That's up for debate, though, it seems more likely the studio will release it online. David F. Sandberg (Lights Out) directed the movie, which is part of a new wave of DC movies that will be doing their best to course correct after the failure of Justice League last year. You can check out the cover and the new photo for yourself below. Shazam is set to arrive in theaters on April 5, 2019. This news comes to us courtesy of Entertainment Weekly.